Spice Box with Cloves SB-1 CAT# SB - 1. Spice box with cloves. Size: 2" X 1.6" X 1". .It has long been customary to beautify and honor the Mitzvah of Havdalah by placing the spices in an artistically beautiful spice box. 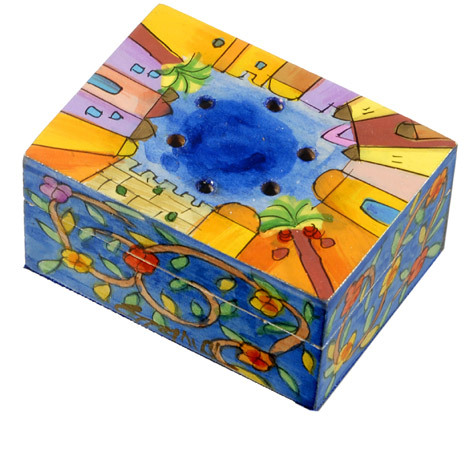 Spice boxes for Havdalah are among the most lovingly embellished objects of Jewish ceremonial art. Havdalah is intended to require a person to use all five senses-- to taste the wine, smell the spices, see the flame of the candle and feel its heat, and hear the blessings. According to some customs, at the conclusion of Havdalah, the leftover wine is poured into a small dish and the candle is extinguished in it, as a sign that the candle was lit solely for the mitzvah of havdalah. Based on Psalms 19:9, "the commandment of the Lord is clear, enlightening the eyes," some Jews dip a finger into the leftover wine and touch their eyes or pockets with it. Because it was used for a mitzvah, the wine is considered a "segulah," or good omen.